This week on Massive Art Attack we will be switching things up a little for variety’s sake. The last two weeks we reviewed the art of Ice Age and Alliances. This week we are going to be focusing on a specific artist, my favorite artist to be exact. It’s the John Avon article everybody! We’ll be taking a look at some of his best work and we will also be checking on some John Avon illustrated cards that could be a good fit in your commander deck. 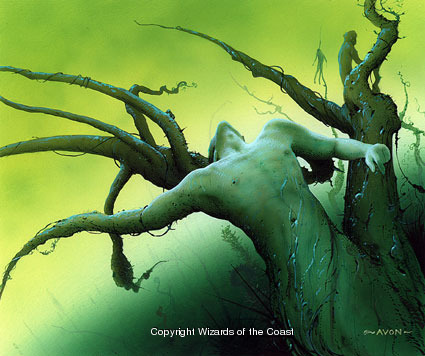 If you are unfamiliar with John Avon’s work, feel free to swing on over to his personal website. Some purists (haters) might not like that he does a lot of his work in the digital medium but I think the results speak for themselves. 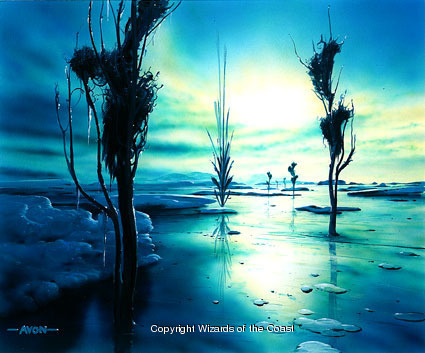 He is probably best known for his slammin’ landscapes. 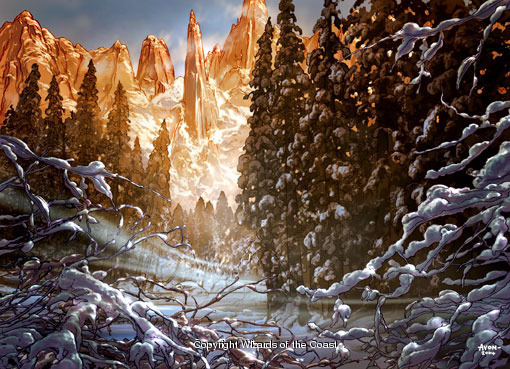 For example, he first popped onto the Magic scene back in 1996 with the Mirage expansion where he did the cycle of art for Mountains. 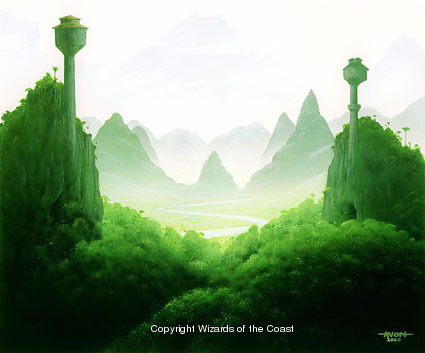 As of this article his art has been in sets as recently as Gatecrash with Thespians Stage and Orzhov Guildgate as well as a cycle of basics in Return to Ravnica. I am curious to know, who is your favorite artist? Leave a note in the comments or feel free to email me at olwhiskeyboots@gmail.com. Also I’m not highlighting any altered art this week, but it will be back next week. As always if you have any altered art you have created or that you have in your own commander deck, feel free to send it my way at olwhiskeyboots@gmail.com and I’ll be sure to highlight it in an upcoming article. d Fellwar Stone – Ninth Edition: Sure beats the art from The Dark! 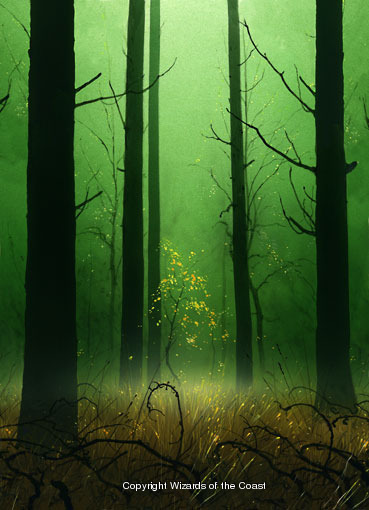 Karplusan Forest – Ninth Edition: This is my absolute favorite John Avon art. Never has paying a life for Gruul colors looked so good. Now lets take a look at some John Avon cards that you may not of heard of that could slip nicely into a commander deck of yours. Some of them aren’t exactly secret tech, but I honestly don’t seem them played all that often. 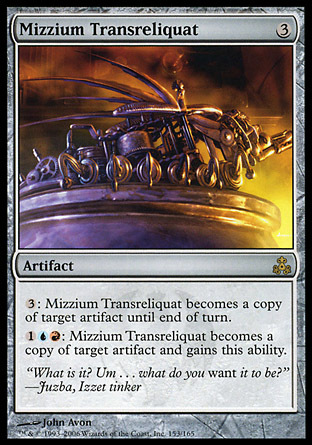 Mizzium Transreliquat: Its sculpting steel that just keeps on sculpting. Need another Gilded Lotus? Transreliquat it! Need to blow up a totally broken legendary artifact like Krark’s Thumb? Transreliquat it! Did all the permanents just become artifacts as well? Transreliquat… anything! 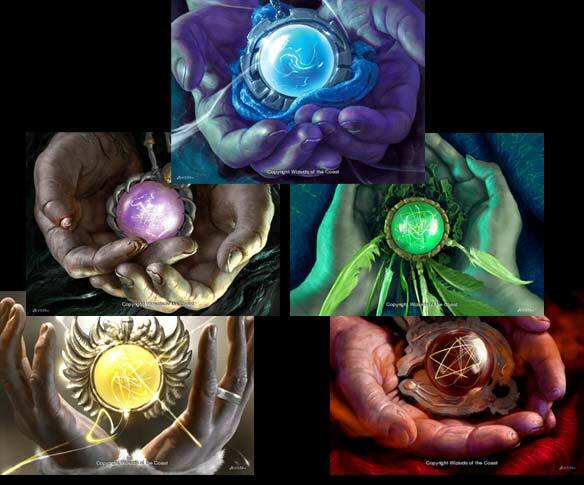 If you are running izzet colors keep this handy artifact in mind. 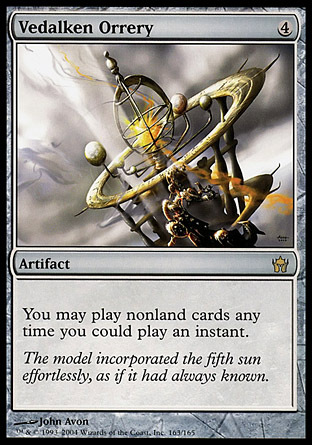 Vedalken Orrery: Ok maybe this one isn’t exactly under the radar as much as the others but a colorless Leyline of Anticipation is hardly ever bad. I don’t think I need to explain how all of your creatures having flash or your big sorcery sweepers threatening the board at all times is good. Combine with Seedborn Muse to either win or become a big dead hate magnet. 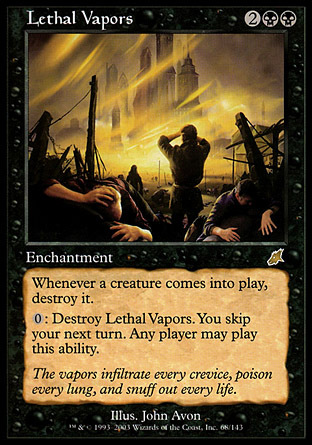 Lethal Vapors: I have not played this card myself, but it looks like some solid sadistic fun. Is the board going to stall out until someone gets enchantment removal? Is an opponent going to be peer pressured into skipping their turn? I bet someone will if you try to Pithing Needle it. You won’t know the political scenarios this card creates until you try it yourself. 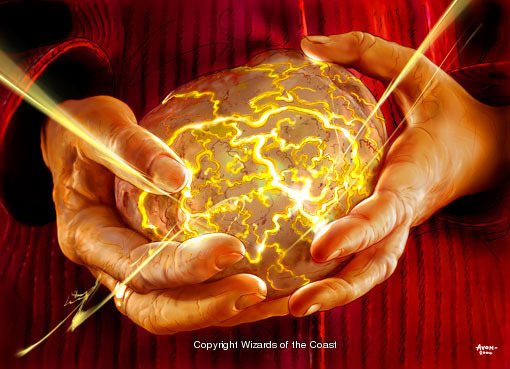 It could even create an auto sac outlet for your own creatures. Combine with some enchantment recursion and I’m sure hilarity will ensue. 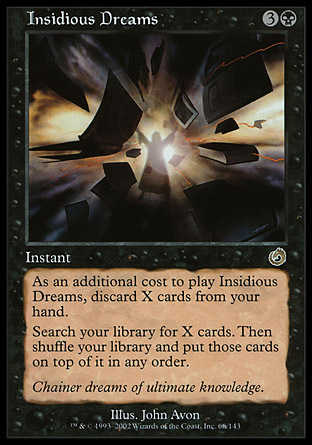 Insidious Dreams: Sure a good player would probably tell you this is some sort of card disadvantage, blah blah something something math. With the right kind of deck dumping those cards into your yard could be a benefit especially if you just chucked some fatties and then stacked a Living Death on the top of your deck. With the card draw available in black getting those cards from the top of your deck into your hand quickly shouldn’t be a monumental challenge. Nemata, Grove Guardian: When you see a giant tree that is using another tree as a walking stick you know things just got pretty serious. Nemata has been one of my favorite cards for token decks for ages. 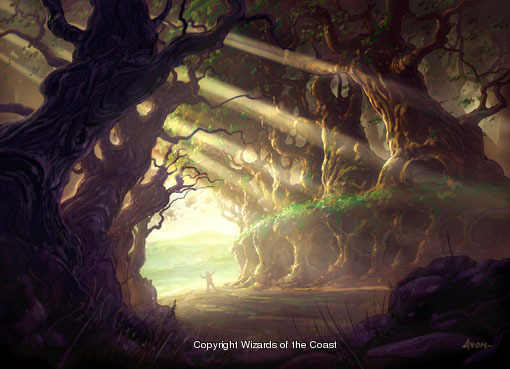 He can make tokens if needed, but if you already have some saprolings in play he can create huge swings with no mana investment beyond the treefolk legend himself. 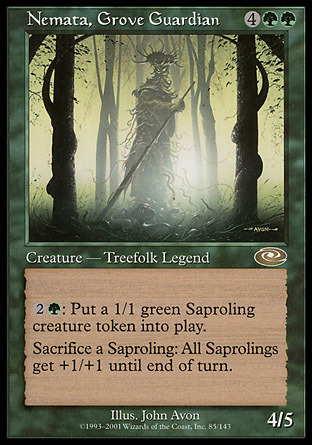 If you have 12 saproling tokens in play, which honestly isn’t a huge stretch, you can swing for a full 40 damage by sacing four of them. Sure overrun would do similar damage in this situation, but you also get a decent sized body that has the ability to make more saprolings and do it all over again. 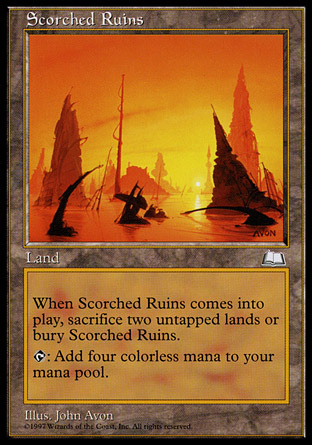 Scorched Ruins: Not many people I play with run artifact-centric decks, otherwise I’m sure I’d probably see this card more often. 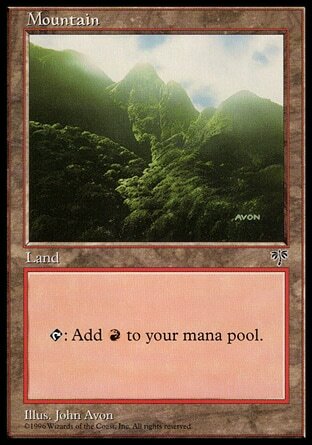 If you are running something like Life from the Loam or Crucible of Worlds saccing the land shouldn’t be too crippling for the nice mana boost it provides, especially combined with effects that untap lands or copy them like the new Thespians Stage. If you see a lot of targeted land destruction, the ruins will probably become a lot less fun for you, but at least there will be some sweet art you can look at in the yard while you lose. That about does it for this iteration of Massive Art Attack. Feel free to post your thoughts in the comments or contact me at olwhiskeyboots@gmail.com. Thanks for reading!